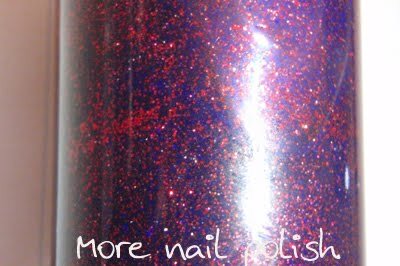 After showing you the ordinary Ulta3 Red Glitter yesterday, I thought I would show you how I frankened a bottle of this into another polish. I added about a teaspoon of extra red glitter and about half a teaspoon of Ultramarine Blue pigment. A couple of balls and then some vigorous shaking. Up close the bottle looks crazy. It ended up with much better glitter coverage on the nail than the original polish. 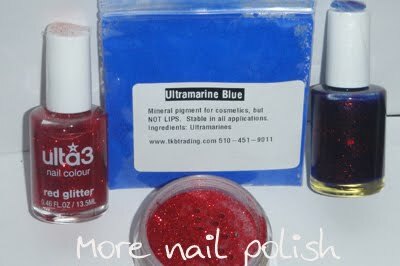 And the strong blue jelly base got rid of the total transparency of the original polish. This was three coats. 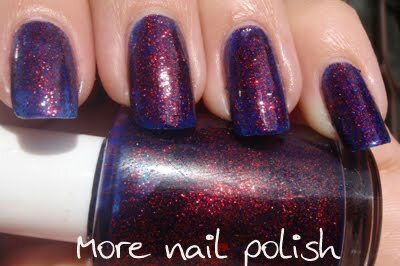 It's certainly an interesting polish now and looks better on the nail than this photo. I think it needs a bit more shaking, because there were a few streaks of blue pigment going on the nail, although after three coats you don't see them. I like what you did with this,Kitties26!